The Perfect Sales Video is all about results. 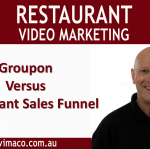 No, not your results, but the results for your potential customers watching your video. You see they don’t really care about you or your business. They only care how you can help them solve their problem. Your sales video should always be focused on your audience’s perspective. That means you need to be able to sum up your product’s appeal in one result. Re-define your product as an end solution eg. you offer a “Hole Creator” rather than a “Drill”. The better your solution is, the higher perceived value they will have for your product. The success of your sales video can be determined by just three things; that you are targeting the right audience at the right time, your product will actually help them solve their problem and that you have constructed your offer in the most effective way. Whilst I can’t point you to your right audience or create your product for you, I can however help you to shape your message so that it will create the maximum desired impact. The first thing a viewer wants to know is if they have clicked on the right video for them. So you need to re-assure them right from the start that they are in the right place. Grab their attention by asking a provocative question relating to their problem. For example you may say “have all the new diets you’ve tried making it harder for you to lose weight?” Or perhaps you can state a startling fact, a bold claim, a shocking disclosure or a compelling story. Once you have told your audience that the video is focused on their problem, you need to assure them that you have the solution. A simple reverse of the problem will do the trick. For example if they suffer from back problems, then tell them you can help to them wake up in the morning feeling pain-free. In order to motivate people to take action, you need to stimulate their emotions. The more pain they feel, the more urgent will their need to relieve the problem. You can apply pressure to the problem by highlighting how their pain affects their day to day life and stops them doing what they enjoy. Now you can release the pressure by telling them the solution. Their problem will be solved and they will be free to enjoy their future life ‘pain free’. Whenever someone says they can help us, we immediately asses their ability to do so. In certain circumstances, if that person is wearing a doctor’s or a police uniform, we would feel much more comfortable than someone wearing pyjamas. You must lay out your credentials on the table and tell your viewers why they should listen to you. What is your experience? Have you been there yourself and worked out how to solve the problem. What differentiates your product from your competitors? Don’t sell yourself short and show the results that you have produced. Share what others have said about you. Now it’s time to clearly explain what your offer is. Tell them why it’s great for them and focus on the value it provides. There’s no need for a hard sell because you have already set up the platform. There is likely to be some questions and objections about your offer. Don’t shy away from them and wait for someone to raise them with you. Be proactive and bring them up before they do. Answer them clearly and support your answers with facts. Use testimonials from your best customers to further your cause. Your potential customers will always feel that they are taking a risk when purchasing a product online, particularly a digital one. What if this training program doesn’t work for me? Will I lose my money? You need to turn the risk around from them to you. The Seller takes the risk, not the Buyer. You can easily do this with an unconditional Money Back Guarantee or a ‘try before you buy it’ offer. No doubt some people will do the wrong thing by you but you will significantly make more sales with a guarantee than without one. Scarcity is a powerful tactic for persuasion. Many potential buyers won’t complete the sales process until the final moment before the sales ends. So to increase your sales, you need to have a clear deadline. You can offer an Early Bird discount or an extra Bonus if they purchase now. You can also alert them to the limited number of VIP seats available or have a clock counting down until the shopping cart closes. Whichever way you decide to go, be sure you are true to your word. If you close the doors to the sale, then don’t make any exceptions or your reputation will be destroyed and those that got in on time will never trust you again. Everything you have undertaken so far is to lead you to this final step, the Call to Action. What do you want them to do? Keep it be simple and clear – “click the green button below”. Remind them of their pain and the relief they will gain from your product. Ok now you know exactly how to craft your perfect sales video. So get on and do it.